After an unsuccessful trip to New York in 1986 during which he failed to find work as a comics artist, McKean met writer Neil Gaiman and the pair collaborated on a short graphic novel of disturbing childhood memories, Violent Cases, published in 1987. This was followed in 1988 by a Black Orchid miniseries (again with Gaiman) and Hellblazer covers for DC Comics. Beginning in 1989 he produced the covers for Gaiman's celebrated series The Sandman, all its collected editions and many of its spin-offs, and the Batman graphic novel, Arkham Asylum, with writer Grant Morrison (1989). His work during this period was often compared to that of Bill Sienkiewicz. Between 1990 and 1996 McKean wrote and drew the ten issues of Cages, an ambitious graphic novel about artists and creativity, illustrated in a stripped-down pen and ink style influenced by JosÃ© MuÃ±oz and Lorenzo Mattotti. 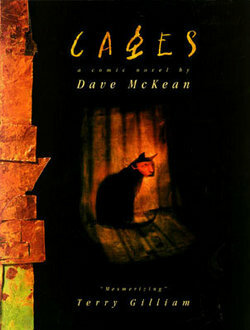 Cages was published as single volume by Kitchen Sink Press in 1998, and in a new edition by NBM Publishing in 2002. Further collaborations with Gaiman produced the graphic novels Signal to Noise in 1992 (previously serialised in The Face magazine), about a dying filmmaker and his hypothetical last film, and Mr Punch, which explored similar themes as Violent Cases through the imagery of the Punch and Judy show. Outside of comics, McKean has produced CD covers for Tori Amos, Alice Cooper, Counting Crows, Michael Nyman, Toad the Wet Sprocket, Skinny Puppy, Download, Front Line Assembly, Bill Bruford and many others; book covers for Jonathan Carroll, Iain Sinclair and others, illustrations for The New Yorker, and advertising and commercial art. He has published two books of photography, A Small Book of Black and White Lies (1995) and Option: Click (1998), and a book of short comics, Pictures that Tick (2001). In 2005, he designed the poster for the 32nd Telluride Film Festival. More recently McKean has collaborated with Neil Gaiman on two children's picture books, The Day I Swapped my Dad for Two Goldfish (1998) and The Wolves in the Walls (2003), and illustrated Gaiman's children's novel Coraline (2002), as well as S F Said's Varjak Paw (2003). MirrorMask, McKean's first feature film as director and visual designer, premiered at the Sundance Film Festival in January 2005. The screenplay was written by Neil Gaiman from a scenario by McKean. A children's fantasy which combines live action and digital animation, Mirrormask was produced by Jim Henson Studios and stars Stephanie Leonidas, Gina McKee, Rob Brydon, Stephen Fry and Andy Hamilton. McKean is also an accomplished jazz pianist, and founded the record label Feral Records with saxophonist Ian Ballamy. Prices current as of last update, 04/15/19 11:14am.